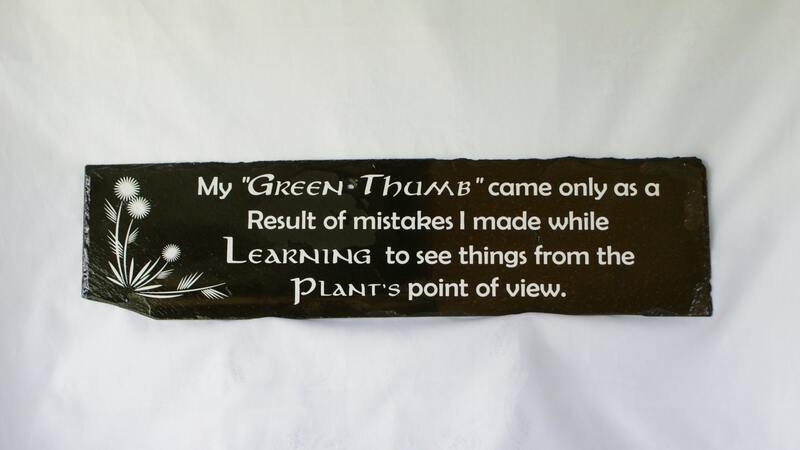 If you have a "Green Thumb" this design is for you! You have clearly mastered thinking from the perspective of the plant! This Three Dames Dreamin' original design was created using an irregular slate approximately 5.75" x 24". Slate can be easily drilled if you wish to hang this piece. It can also be framed or set on an easel (sold separately). Each slate contains irregular edges and surface, which makes them each unique in appearance. Also note that one pictures shows a natural slate and the other a slate which has been painted black. The photos show two different pieces. You can see the design has been modified to accommodate the nail holes found in these authentic roof slates. We can create any saying you like, just ask!